This ring is almost a force unto itself, possessing an impressive style and a level of detail that means it is bound to get noticed. When you wear the Vis Viva Dragon Ring, you will be sure to get noticed along with it. This ring cleverly combines gothic style with fantasy design, creating an accessory that features the best of both worlds. It depicts a serpentine dragon that wraps snugly around the finger, while still possessing all the detailing that one would expect, including intricate horns and fins that adorn its head, while its long body has fine scales and short body spikes. This dragon also has a gems encrusted into its hide, which take the form of three black Swarovski crystals that run along the spine. The ring is made from fine English pewter and is offered in six different sizes, ensuring that anyone can enjoy this great accessory. 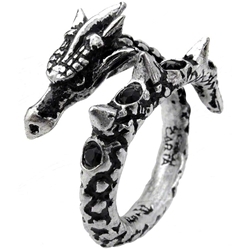 If you want something that is lively and powerful, yet subtle and striking at the same time, then perhaps you ought to consider this Vis Viva Dragon Ring, as it has all the impressive detailing that you want in an accessory, while still possessing a subdued design that works wonders with casual and contemporary looks of all sorts.